Until I started my teacher training with Robert and Wai-Mei at Barefoot, I never really tallied up or thought about how much I had been practicing yoga before. I had taken two classes at a gym, which were fine, but my practice consisted of my mat and I wherever we were. I would use books with handwritten routines, home DVDs, and eventually apps until one day, I was practicing a headstand and fell backwards. I knew what to do, and did not hurt myself, but it still scared me a bit not having anyone around to help me. It was then that I realized that my dream could become a reality if I just wanted it and made the space. I immediately connected with the philosophy and style at Barefoot and I signed up for the training one day before it started. It was there that I realized that I had actually already spent 10 years practicing this artform that is yoga. My journey started in while doing the Power 90 (P90X) program with Tony Horton. The 10 minute Power Yoga session quickly became the only part that I wanted to do and I integrated it into all of my workouts while playing volleyball. 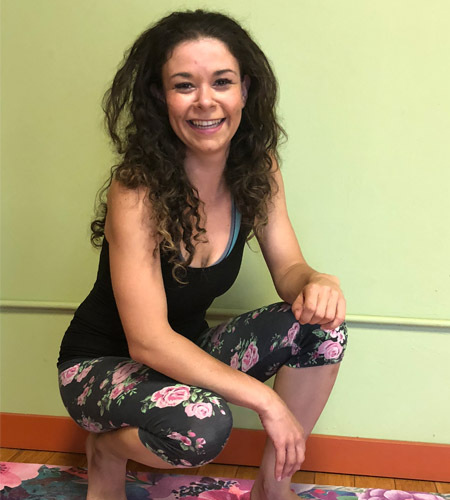 Shiva Rea became my sole yoga teacher for the next 7 years, and her combination of free flow, strength, and flexibility made for the perfect workout for my body, which was constantly injured from life and sports. My pregnancies proved to be the point that would fully integrated yoga into my life because my practice helped me so much physically- if I did not do pigeon pose in the morning, my sciatic pain would have been too much to handle. My deliveries left me with hip and tailbone trauma that I am still dealing with to this day, but without yoga, my healing process would have been much longer and harder. I fully attribute yoga to losing 85 pounds after my second child to finally be back to my pre-pregnancy weight. But more than that, yoga has given me so much more. I am more centered, more still, more ready to handle the world. Through teacher training, I learned more about myself than I ever have. It took my very pitta teacher showing this very pitta student how to accept and love yourself always to fully have the confidence to give your heart to something that you know is your calling. Although we learned so much about the physical poses and alignments during training, for me, it was learning about the rest of the limbs of yoga that truly made the difference. These simple truths that connect us are so grand and life changing when fully integrated and accepted your life. I am blessed to have found a home here at this studio where that message is so fully preached and where I have the space to be open, be a student, and be a life-long learner. During my training, I continued to make connections between my life and the scriptures of yoga that started to give more meaning to my life. My deep connection and devotion to the Dalai Lama and his writing suddenly took on completely new meaning, and even my academic interest of medicine suddenly took on a new light. Yoga teacher training has reminded me of my early fascination with Ayuvedic medicine and some Russian roots to herbal medicines, and has led me to find two incredible schools where I will be continuing my pursuit in medicine, while getting to integrate everything else in my life. Yoga has been the single greatest gift and tool that I have been bestowed. It has given me direction, health, happiness, connection, and inner awareness. I am so grateful to have such an amazing gift to share with the world, for I feel like I finally have found that one thing that I am happy to have define my life.